"What's with you and the Germans?" The DVD Review and the Extras Review are by Jon Danziger. War is hell, and so is having to watch this movie. It's a great big bloated mess of a war picture, and its three-hour running time and high-profile cast virtually invite us to make comparisons to other films in the genre; without exception, all of them are unflattering. 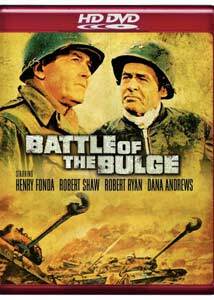 This is certainly not intended in any manner to question the heroism of those who fought for the Allies in this battle, one of the longest and bloodiest of the Second World War; but as a motion picture, Battle of the Bulge is neither entertaining nor edifying. And my goodness, it goes on and on and on. The self-importance of the picture is evident from the jump, with an overture; after about an hour and forty-five minutes, we're also favored with an intermission (any decent filmmaker with a shred of respect for his or her audience would have ended the picture there), and after the credits roll, you can bask in the afterglow with exit music. You'd have to be some serious Greatest Generation diehard without a bit of aesthetic sense to want to do so, however. Henry Fonda elevated everything he was in, but even he can't do much with this one—he stars as Colonel Kiley, a natural leader of men who's a cop back home. He's got a hunch about what the Germans are up to, but the higher-ups in the Army brass say that he's wrong. You can almost sense the conscious effort to try and capitalize on some of the inevitable associations with Fonda's indelible performance in the title role in Mr. Roberts, but it only points up how much better that film is than this one. The same can be said about the presence of Dana Andrews; the movie under review here cannot hold a candle to The Best Years of Their Lives. You know your movie is in trouble when you're leaning on Telly Savalas for comic relief—he's a sergeant looking to make a killing on the black market with perfumes and stockings, for the dogfaces to give to the frauleins—but the most lunatic bit of casting here no doubt is of a peroxided Robert Shaw as the principal Nazi on hand. Shaw was a terrific actor in a whole string of movies (Jaws and The Sting stand out for me), but with the map of England stamped on his face, he's nobody's idea of the paragon of the Thousand Year Reich. The movie generally travels in the most shopworn portrayals of the various nationalities—Americans are universally hardscrabble and upstanding, Germans are decadent and fey; that may well have been the case in the battle, but must we get three hours of that here? Don't hold out hope that it will all come together in a climactic battle sequence; what's here is pretty pedestrian and plodding, never visceral and exciting. Before that point, we've had to suffer through many scenes at the German command post, with toy tanks being pushed around a model battlefield in what plays like a mad game of Risk. It's a movie that almost seems to know that it's not very good, so it just keeps piling on—bigger is bigger, and more is more. So it's overscored and overcut; what really gives away the store is a final title card, telling us that, though based on historical circumstances, "places, names and characters have been generalized," which is exactly the problem. It's a movie that needs more specificity, not less, and as it stands it doesn't do much to burnish the reputation of those it so wants to honor. Image Transfer Review: From the first moments of the picture, the clarity of HD provides a revelation. The delicate nuances of the woodblock title sequence are transmited faithfully and crisply. The matte shots are no more convincing than on the standard disc, and edge enhancement is visible in sequences jtaking place in an airplane cockpit. The model work of ruined Belgian cities is laughably exposed in the higher detail as being substandard to devastated Tokyo in Toho's Godzilla pictures. The picture, such as it is, is well rendered, with nice differentiations of greens in the expanded colorspace of HD. The abundant smoke and flames are attractively portrayed, with little compression noise or artifacting. Reds are amazingly vivid, and in particular the Nazi uniforms come across in sharp detail. It looks like a newly-shot picture for much of the running time. Audio Transfer Review: The first hour or so of the film tends to be very center-bound, with only occasional moments of surround activity. Once the battle begins in earnest, however, the speakers come alive with a crisp clarity. While the musical soundtrack is still mixed a bit high, the dialogue at least is not as muffled as was the case with the standard disc. It's not a reference or display piece by any means, but it does manage to be reasonably immersive if more than a shade lacking in low bass. The overture, intermission and exit music are all included in this issue of the disc. Extras Review: None of the extras are in HD. A commentary from director Ken Annand cast member James MacArthur (of Hawaii Five-O notoriety) is significant only in the length of the silences in between the self-congratulatory remarks. The only other extras of note are two featurettes produced at the time of the film's original theatrical release. The Filming of The Battle of the Bulge (09m:35s, and note the inappropriate addition of the definite article to the movie's title) vouches for the film's authenticity; History Recreated (08m:04s) features junket interview footage with Shaw and with producer Milton Sperling, who had served as a World War II combat cameraman. A bloated, unpleasant, unattractive war movie; it does no great honor to those who served in World War II, and in many respects exemplifies what was wrong with the studio system in the mid-1960s.